Golf carts can become dirty very easily. 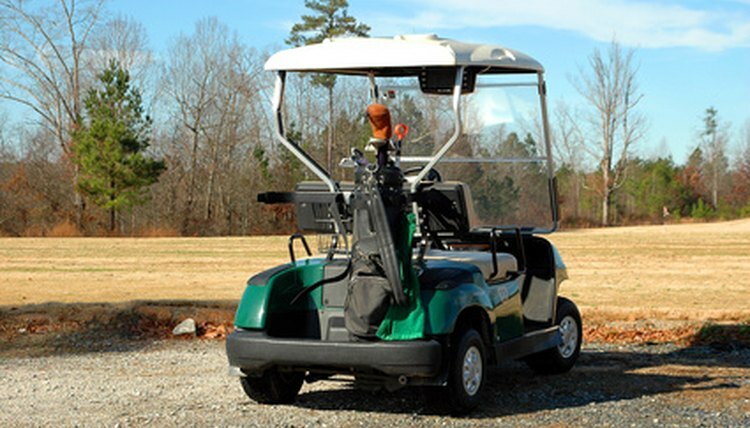 When you take your golf cart on the course, it is exposed to dirt, dust, leaves, sand and grass. A rubber mat can help prevent the floor of the cart from becoming permanently soiled, but if you don’t clean the mat regularly it too can become stained. Take the mat out of your golf cart. It should lift out easily since it is not attached to the floor. Shake out the mat to remove the loose dust, dirt and sand. Lay the mat on a flat surface and sweep away the rest of the debris with a push broom, or vacuum it with a vacuum cleaner. Turn on the hose. Using the sprayer nozzle, spray the mat in rows starting at one end. This should remove the ground-in dirt. Dampen your sponge and squirt a teaspoon of dish soap onto the soft side. Use this side of the sponge to wipe down the top of the rubber mat, again in rows. This helps ensure you scrub the entire mat. Flip the sponge over and scrub the mat again with the rough side, focusing on any stubborn dirt or stains you couldn’t get out in Step 2. Rinse the mat again with the hose. Turn the mat over and repeat Steps 2 and 3 for the underside. Let the rubber mat air-dry. Hang it up so that both sides can dry at the same time. If you need to use it again immediately, wipe both sides with a moleskin towel. They are available at most auto supply stores. Place your mat back in your golf cart in the same configuration as when you removed it. This will help ensure that it doesn't slide.